I finished this design for the folks at Blue Sky Alpacas late last year, and it’s finally available on their web site. I got to see proof for the pattern–and a beautifully done green version stitched by one of the Blue Sky Folks–on display at TNNA in January. But yesterday, I got my copy in the mail, and found it’s now listed on their web site. I have to say, I love the photography. Since I normally take pretty amaturish photos of my work myself, (and without an actual model) it’s so cool to see it professionally styled and shot. 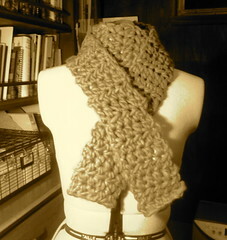 The scarf is done in their alpaca silk which was so easy to work with. When I made scarves to sell in boutiques in Seattle, I leaned toward bulkier yarns, or I combined several strands because I was all about finishing quickly (and the multiple yarns gave the scarves a one-of-a-kind quality) but now, I’m much more attracted to simple, fibers, interesting textures and lighther weight yarns. I’m finishing up a vest now for Blue Sky which I hope will be available by TNNA in June. I’ll let you know.